Storage space has been an issue for homeowners for a long time. Many find that building a loft in a small shed is one way to add more room for storage. While this may be a simple project for the woodworking homeowner, care should be taken regarding the weight limits of the loft built. Explore the weight limits of 2-by-4s and 2-by-6s when they are stretched across the width of the shed. Locate the studs in the walls in the area where the loft will be built. Measure and cut a piece of plywood the desired length of the loft. Be certain it is 8 inches wide. Measure out from the walls of the shed to the desired width of the storage area and make a mark. If using the entire width of the shed, divide the width by three and mark the joists accordingly. Measure down from the rafters to the bottom of the ceiling joists and cut twice the number of joists used. These are for braces and will be used to strengthen the ceiling joists allowing for more weight. Secure the braces to the rafters and the ceiling joists with the deck screws. Be certain the braces are plumb as this will give the maximum strength possible. 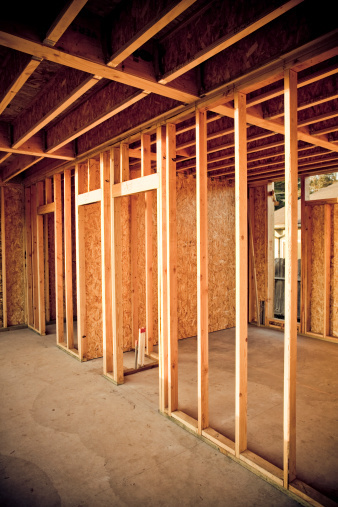 Measure and cut a piece of 3/4-inch plywood to fit on top of the ceiling joists in the desired storage area. Secure it to the ceiling joists with the deck screws.